My Impressions: Simon Says Stamp Smile Journal Card (& GIVEAWAY)! This card is so cute! I always love Simons kits! Thanks for the chance to win. Great card...this kit is really so fun and love how you kept this card really simple and just angled these panels. Super cute. I just love this kit so much. I'm really enjoying the bright colors of this kit, especially the patterned papers you show off so well in your cards. Oh how cute is your card, too cute!! So cute! I like that you used the journaling cards. This kit does make me smile! The patterned papers are just awesome! simple and cute! love it! Great card! Love the happy colors! And thanks for the chance to win! Very pretty! I love the camera! i love the colors iin your card"
Love the colors!! This is a beautiful kit! I never know what to do with those journaling cards when I look at the paper. I really should remember that they're just like tags! Love it. And that camera is adorable! Every. Single. Piece. Of this SSS kit is HAPPY! All your cards designs with it have been so happy, too, Sarah! What a charming card! So fun and happy! Love this fun and easy card! That little epoxy camera sticker is adorable! The "Smile" on the stamp is really nice. Sweet card! Love the pattern paper and puffy stickers!! Such a cute card! Love the bright colors & those Summer Shapes enamel stickers. I love the stitched mat and colorful papers in this CAS card! 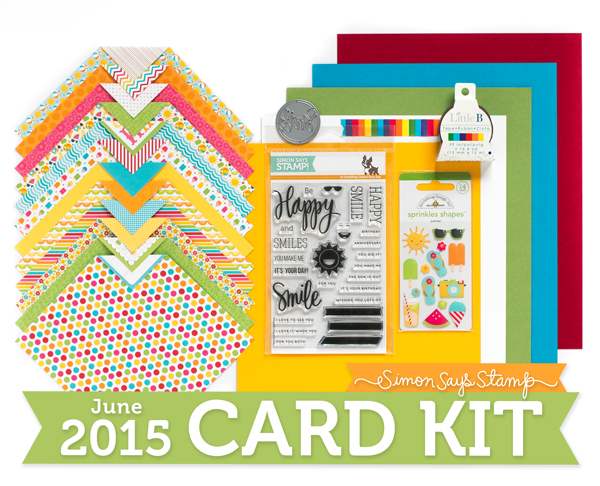 What a fun card kit! 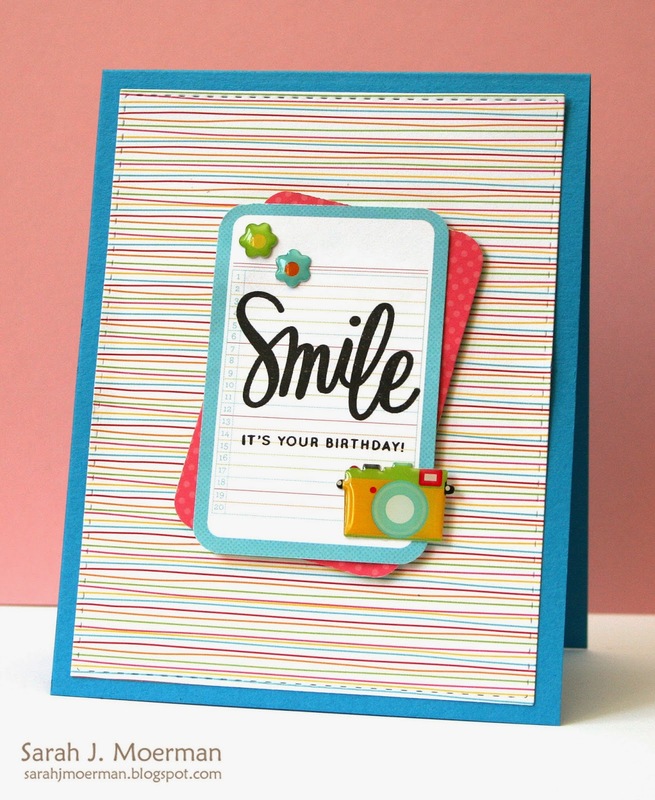 Love the smile die and love those cards you have made. I've never had any type of card kit before so I am drooling over this kit and all the gorgeous cards you've been making! Today's card is beautiful! Love the stamps in this kit! Such a good vibe from this kit! I love the bright colors. So simple but stunning & fun!!! This is a cool kit. Great colors, stamps & paper. Love your card. Love that smile, great CAS card! I love the new kit! Thanks for sharing your wonderful design! Hi Sarah! I love how you take these beautiful papers in the kit and some of the accessories and create a wonderful card. Sometimes, less is more, you constantly inspire Me to look at product differently. I wouldn't say, I'm a paper hoarder, but I tend to use solid colored CS, rather than patterned. Thanks for sharing your techniques! Your card is so cute, love the papers and the Doodlebug stickers in this card kit. Thanks for sharing? Have really enjoyed all your cards from this kit, they are so bright and happy. Perfect for you upcoming Summer and gives me something to look forward to once we get thru our Winter!! Your card is adorable. Love that background paper. Lovely cards! This kit is so fun! I love the Smile stamp! The camere icon is cute! Such a bright happy card, that's a fabulous kit!